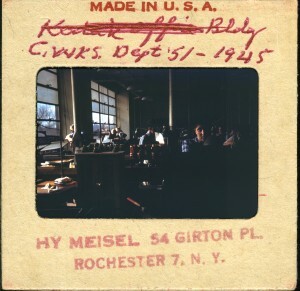 Hy Meisel lived his entire life in Rochester from 1895 to 1980, and he worked as a machinist for Eastman-Kodak, which has been based there since the 1880s. 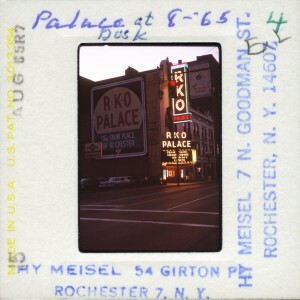 Though Kodak now employs only a couple thousand workers, it was the city’s largest employer for most of the twentieth century. From census records I know that Hy didn’t finish high school but could read and write. While growing up, his family moved frequently to different homes in the same predominantly German neighborhood. His father was a sometimes preacher; they often took in boarders. I found Hy’s draft card and the passenger list from his cruise to Guatemala. I learned that Hy never married, that he never had kids. Much of this is in the slides, or rather, it is conspicuously absent from them: there are few weddings, no babies in delivering blankets. There are, however, friends and vacations, landscapes, cityscapes, and a cigar box full of sunsets. Hy was a serious hobbyist. Hy would have purchased discounted cameras and film at the company store. He belonged to the Kodak Camera Club, where for pocket change he’d have all the paper, chemistry, and darkroom time he needed. Photography mattered to Kodak workers—they signed up for photo courses, they collected antique cameras, and both telephone operators and research scientists have spoken of submitting portfolios of their work when applying for internal promotions. The distribution of photographic materials to workers was a crucial step in product development, as employees would troubleshoot new products. But it was also productive of a collective identity among workers. Even though labor was compartmentalized in the space of the factory, employees could grasp the sum of their labor in the practice of photography. 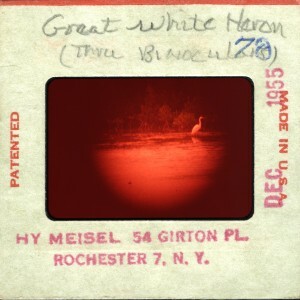 Most of Hy’s slides are Kodachromes, made between 1945 and 1979. If stored properly, they should retain their vibrancy for two hundred years. They are still sensitive to their environments. They fade faster with more exposure to light; insects have a taste for the gelatin emulsions that coat the slides. 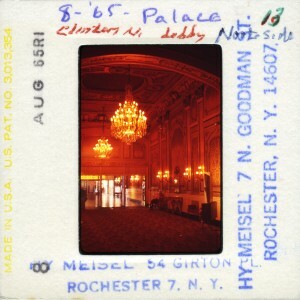 But for the most part, the colors are so punchy, so oversaturated and rich, that if it weren’t for their obvious obsolescence and the fact that the buildings in the images are no longer there, Hy’s slides could have been made yesterday. In them, as Carolyn Steedman writes of archives more generally, “something has happened to time: it has been slowed down, and compressed.”3 Placed on a light box and viewed through a loupe, Hy’s street scenes and vacationed faces glow with fleshy realism. The light brings them to something lifelike but not quite. The Kodak palette, a former Kodak employee told me, was never supposed to exactly match the reds and greens of a Christmas tree. The average American family, he said, would be on the same roll of film come Easter, long after the tree shed its needles. Even in their own time, the slides were a dreamspace and their reference was memory. When it was patented in 1935, the Kodachrome developing process took over three-and-a-half hours, and it required multiple rounds of developing and bleaching the exposed film. 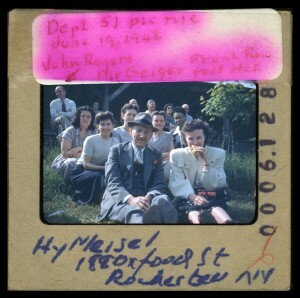 In the 1940s, in response to the Army’s request for a color film that could be processed on the spot and in small batches, Kodak devised a color slide film with a streamlined developing process. Released to consumers as Ektachrome film, it could safely be processed at home with the use of nontoxic developing materials.4 This simplification, however, meant a compromise in image stability. Some components of the film deteriorate faster than others; other elements continue to react and can set off an imbalance in color, even when stored in the dark. The Ektachromes in Hy’s collection have faded to purples, blues, and reds, depending on the image and the formula used, depending on how the reactive couplers and dyes have strayed among the layers of emulsion that coat the film. Sometimes the fading works. 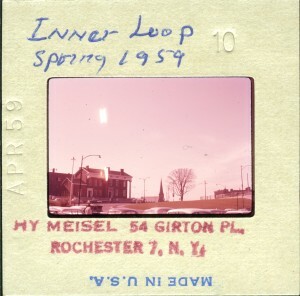 Bare trees really are that pink in Rochester in March, and in Hy’s slides of the Lazy Bones Cruise, the red tint reads like the haze of a Florida sunset. Hy is the most relaxed I’ve seen him. As the yellow dye degrades and magenta consumes the image, new atmospheres become palpable. 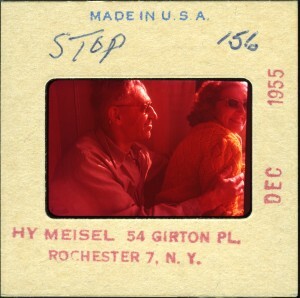 The desaturated slides embody what Lauren Berlant calls “the waning of genre”5 or “the attrition of fantasy, a collectively invested form of life, the good life.”6 From the perspective of the late industrial7 present, their red glow has endowed Hy’s images of the middle-class, midcentury good life with a surreal and generically nostalgic quality. It is through such atmospheres and affective resonances, Berlant argues, that people apprehend the historical present and that new aesthetics, genres, and styles of belonging emerge, amidst outmoded conventions of how to build a life. Held up to this light, the chemical instability of the film signals an instability in prototypically American narratives of how life should be lived. The affective pull of the degraded slides hints at how we are making sense of the present and its relation to previous modes of life and labor, in the transitional moment Berlant calls an impasse. 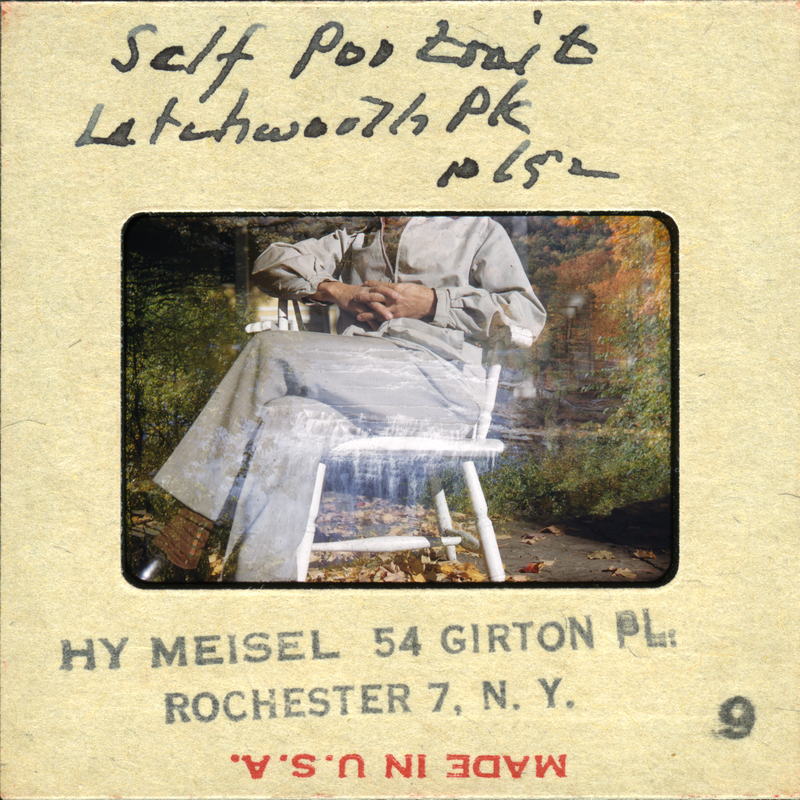 Meanwhile, a metal box of slides has rusted shut. Hy had wrapped rubber bands around the smaller paper boxes. By now they have lost their stretch or adhered to themselves in odd, floppy knots. One decently sized tray is addressed to the George Eastman Museum, another to the Parks Department. 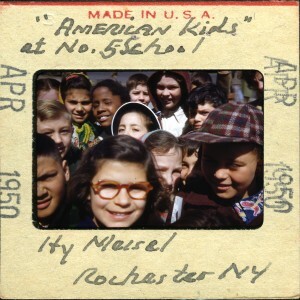 The rest, according to Hy’s labels, were intended for the Rochester Museum and Science Center. Instead, perhaps via dumpster, they ended up in the archives of the Visual Studies Workshop, where I have been viewing them, for the most part alone in the basement in the magic lantern room. Its floor-to-ceiling shelves are stacked with open boxes of these old, glass teaching tools, mostly sourced from the dumpsters of grand east coast museums after the Kodak slide projector made magic lanterns obsolete. One afternoon, hunched over the light box, I caught myself taking in a long, deep inhale of Hy’s slides and holding it in as if to get high. I pulled back and muttered something in surprise, but then breathed in again. There was a smell: faint but musty. Had I been sniffing all along? I tried but couldn’t find it on any other slides. In photographing the city as it changed, Hy seems too to have fallen into a fever. 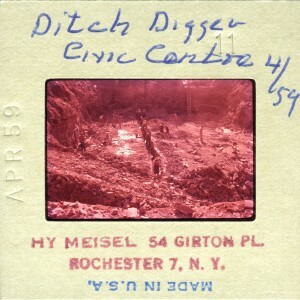 He left behind hundreds of slides documenting the construction of the Inner Loop highway around downtown: before-and-after shots of the post office in the 1940s, road crews, the rubble of a Presbyterian church. 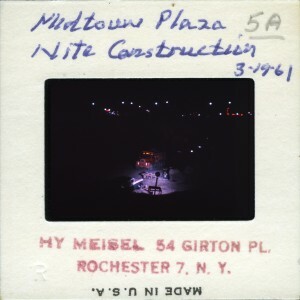 Hy photographed the construction of Midtown Plaza, and he was there at its opening in 1962, observing the crowds and the table settings on display at McCurdy’s department store. Architectural Forum had called Victor Gruin’s design for this downtown shopping mall and office complex to be “one of the most imaginative, well-rounded urban renewal programs in the U.S.”13 But rather than setting off a renaissance, tenants began to leave within a decade. Midtown Mall closed in 2008. It was demolished in 2010, to be replaced by an office building and a residential high-rise still under construction. There is talk of building a casino at the site in collaboration with the Seneca Nation of Indians. The Inner Loop, too, is not all there. The city has begun filling in the eastern section of the highway, and plans have been floated for commercial development along this strip. The changes that Hy documented are now being undone. As objects, Hy’s slides body forth an alternative reckoning with time, one that has endured from an earlier era of production and accumulation. 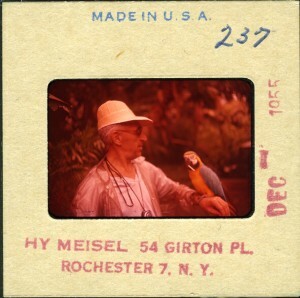 Today, the reddening of the Ektachrome slides enacts the exhaustion of midcentury imaginings of the good life. On the other hand, the two hundred years of image stability that Kodak chemists engineered into Kodachrome dwarfs the timeframes of urban development projects, as well as the lifespan of reinforced concrete. The latter crumbles from the inside as its rebar rusts. That the slides should outlast the concrete is not an accident. Rather, their durability was a technical and chemical achievement, born in part from the assumption that the world as it was would continue to be. 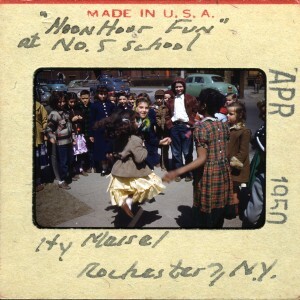 *All images provided by & courtesy of the Visual Studies Workshop, Rochester, NY. This material is based upon work supported by the National Science Foundation under Grant Number 1559245.